Taking over the “super block” of Main, McGowen, Travis, and Anita, Midtown Park offers three acres of pedestrian-friendly streetscapes and greenspace, complete with a sprawling lawn, playground, game courts, market areas, water features, art, a dog run and more, in the heart of Midtown. The area surrounding Midtown Park (a few blocks around the main “super block”) is filled with bars and restaurants, shops and businesses, and plenty of things to discover. 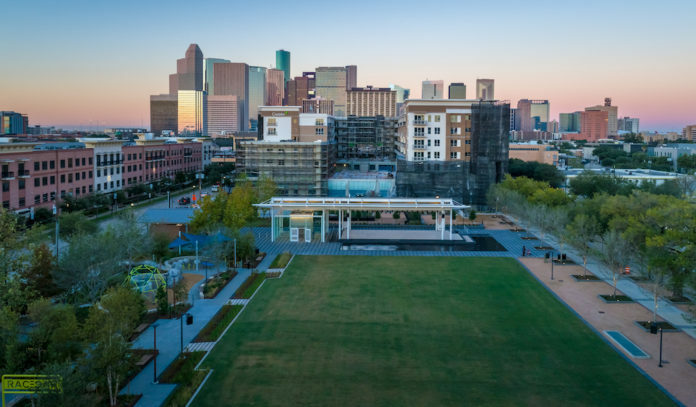 Spend time at Midtown Park – Snap a pic in front of a 16-foot art wall, play a round of bocce, enjoy a picnic on the lawn, and let the kids run around at the playground. 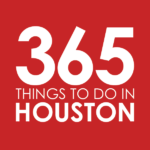 And look out for a lineup of special events, from free community yoga to “yappy” hour. Sing your heart out at karaoke – Two late-night karaoke joints, Glitter Karaoke and Spotlight Karaoke, are within walking distance of the park. Visiting on a Thursday? Check out Glitter Karaoke’s Thursday night food pop-ups featuring different chefs from around the city. YogaOne Studios – Transform your mind, body, and soul with a class at this zen yoga studio. Houston Metropolitan Dance Center – Also known as METdance, this dance center offers classes and workshops for children, teens, and adults. 13 Celsius – One of the city’s coolest, European-style wine bars sits just a few blocks away on Caroline. Sip properly cooled wines from around the globe alongside salamis, cheese, and panino. Capitol Bar – Head to this bar off Main to find a patio, great music, food trucks, and good times. The Community Bar – This neighborhood bar is known for its stiff drinks and Tuesday Steak Night. Damian’s Cucina Italiana – This Midtown stronghold from Johnny Mandola and crew has been serving up Italian fare for over 30 years. Dress up and dine on linguine alle vongole, rosemary-rubbed veal chop and rum-soaked tiramisu. Kim Tai Restaurant – Head to this casual Vietnamese spot for pho, vermicelli, and rice plates. Leon’s Lounge – Unwind with a cocktail at one of the oldest bars in Houston, established in 1947 and sitting pretty on McGowen. Les Givral’s – Off Milam, this Vietnamese sandwich shop offers banh mi and pho on-the-cheap. Mongoose Versus Cobra – Sip serious suds and spirits at this hip bar and hangout. Nouveau Antique Art Bar – This vintage chandelier-lit bar on Main is equal parts artsy and cool. Pho Saigon – It’s all about this pho at this Midtown noodle house; get it filled with fatty brisket, soft tendon, beef meatballs, and flank. Proof Rooftop Lounge – Look out for concerts, DJs, boozy events and more at this rooftop bar and party venue. Saigon House Houston – This modern Vietnamese spot offers authentic dishes and Asian-Cajun crawfish and seafood boils. Simply Pho – Stop by this Milam pho shop for Vietnamese duck salad, grilled pork banh mi, beef stew, and traditional rice noodle soup. Thien An Sandwiches – You’ll find all varieties of banh mi, plus Vietnamese rice platters and noodle bowls, at this longtime favorite sandwich shop. Weights + Measures – Get everything from roasted carrot pizza and braised lamb shank tortelloni to avocado toast and chocolate chip cookies at this stylish restaurant and bake shop. High Fashion Home & High Fashion Fabrics – Shop for high-end furniture, décor, accessories, and home goods at the home shop; or hit up the fabric shop to materials, from linen and laces to silk sheer and beaded trim. Local Notables – This online gift shop discovered offers a curated selection of handcrafted products, all made in the USA. Locals can order online and pickup at its Midtown address. Sable Gate Winery – Blend your own personal vintage, then bottle and custom label it at this Midtown wine-making space; or stop by for bites and sips from over 30 varietals.